Do it right the first time and your arena will stand up to years of use. Mistakes in building a horse arena can be painfully costly, as anyone who has ever had to fork out for remediation work can attest. A horse arena is a major investment for any horse owner and getting it right from the earliest planning stages is essential. I have, over the past six years, received a lot of emails about problems with arenas. It all began when I set about planning to build one. It became apparent that there was plenty that could go wrong, and the end result was a fairly detailed account on Horsetalk of the ins and outs of arena construction. Since then, I have received a steady stream of emails and telephone calls from people all over the world with arena problems. They have ranged from ordinary horse owners who were gutted their arena had failed, to an insurance assessor wondering how he should proceed after a contractor built an arena with problems, and an engineer tasked with putting one right. Rest assured, I have never painted myself as any kind of expert on arena construction but, for many of these people, they simply did not know where to start. My advice to all of these people has been the same – I will get to that later – but what has been illuminating over the years has been the nature of the problems. Invariably, these problems fall into one of seven categories, most of which can be traced back to fundamental design problems. So, where do most people go wrong? No-one will be surprised to learn that drainage is one of the big problems that arise in arena construction. The first step in building any arena with any hope of draining adequately is to locate it in the right spot. The first issue is the natural properties of the soil. Is it stony, free-draining or sandy, or does it swing the other way, with a heavy soil type and perhaps a clay pan a foot or two down? The nature of the ground will determine how much effort will need to go in to get the water off and away from your arena. Choose the site of your arena carefully. Horse owners can win half the battle by locating their arena on a high point on their property, even that “high point” amounts to little more than a gentle undulation. This sounds like a no-brainer, but it is surprising how many arenas are built where the owner would prefer it to be, rather than letting the local geography help out as much as possible. Successful arenas need all the help they can get, and it’s always best to work with nature, than against it. That is not to say that arenas can’t be built in less desirable low-lying areas, but expect considerably higher costs in sorting out drainage issues. For the record, the arena on the writer’s property was built in the third location considered for its siting – that suggested by wife. In hindsight, I know now it would have been a disaster to site it on the first two sites I considered. Think hard. Get it right. Get the drainage sorted first time round. If you’re satisfied your location will work for you, the next step in the design process is ensuring the drainage installed will cope with the demands of the site. It is possible in some locations that you will get away with drains along the sides of the arena to carry off the water, provided the fall is right and, once the water reaches the drains, they themselves have sufficient fall to get a lot of water clear. Think also where the water goes once it gets clear of the area. No-one wants to create a bog where previously there was none. If you’re thinking this is unlikely to happen, work out the surface area of the arena and calculate the volume of water from three or four centimetres of rain. We’re talking a lot of water. This is a big one. Building an arena is not simply about finding a formula online and building it to that “recipe”. The problem is that raw materials differ from region to region. Some places are naturally blessed with an abundance of suitable river gravels, while others have softer “rotten rock” of volcanic origin. The base course arrives: 17 truckloads of AP65. It is highly likely that the costs of trucking the raw materials to the site of your arena will cost more than the materials themselves. With this in mind, anyone building an arena needs to assess the materials available nearby and work out which ones will get the job done. Our own arena uses lime from a local quarry, which compacted down beautifully during construction. Friends some 300 kilometres were recently building arena and had a lime quarry virtually right across the road. It became clear that their local lime had a much higher calcium content and showed a more marble-like quality than our lime. My advice was to test the lime to ensure it performed as intended. In this case, it was ensuring it compacted down to form a hard and uniform layer. In seeking out the best materials locally, it is best to do your homework. Find arenas sourcing local materials that have proved successful. If you’re engaging a local arena builder, don’t be afraid to quiz them on what materials they use and why. This is pretty simple, but many people come unstuck. It’s essential to get the fall right to ensure there is no pooling on the surface. Pooling will result in soft spots and these will ultimately fail. Repairs will be messy and costly. There are many different materials that will suffice for a top layer. It is possible, of course, you may be opting for a commercially made product, and the manufacturer should be able to provide plenty of information on its performance. AP65 – a mix of sand and gravel – is spread before compaction. This is a key element in creating an all-weather arena, keeping the undesirable subsoil material from coming up and playing havoc with the top layers. Many people opt for some kind of sand. Like all the other materials going into an arena, each region’s sand will show different properties. 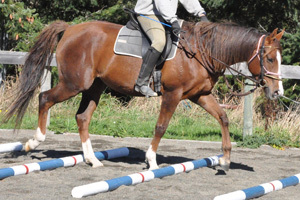 Horse owners want to achieve different things with their top layer. Some want a softer, cushioning layer, while others seek a harder finish. I believe there are several key questions a horse owner needs to ask about their top layer. First, how fine is it? Do not opt for a sand that is so fine that it runs the risk of blowing away in a windstorm. Second, how coarse is it? Are the particles generally rounded or sharp? Too much sharp material runs the risk of being too abrasive on horses’ hooves. There is another performance factor in assessing the right sand: its ability to allow water through. Sands which are too fine run the risk of holding water and becoming “gluggy”. The water becomes slow to drain and the arena proves unusable for days at a time after rain. Again, the best strategy is to look at local arenas and the finishing layer used. How does it feel? How does it perform? Most arena owners will be only too happy to share information on what worked for them. I struggle to get my head around this. An arena may well set someone back the price of a new car. Why not invest some time and a little money in maintaining it? Once built, don’t skimp on maintenance. Get rid of the weeds before their roots penetrate into the lower layers. Harrow it regularly. The sand will have a tendency to move with the fall built on the arena. I get around this by using an offset set of light chain harrows and pulling it only in the direction which tends to push the sand back uphill. It’s a small thing but it works well. Remember that even the most well-drained arena will hold some water for a while. Show it some respect and, if it needs a few days after heavy rain to clear that water, then leave it be. Shortcuts to save money might work, but there’s a pretty good chance you’re on the path to problems. They will always be costlier to fix than doing it right in the first place. Never skimp on drainage or short-change each layer in the construction process. This all brings me back to the two pieces of advice I have given to practically everyone who has contacted me with arena issues, or questions on how to build them. Local materials will vary from region to region, and a formula that works in one area may not work in another. Seek to understand the performance and properties of those materials before deciding whether they will be suitable in your own arena project. Local knowledge counts for a lot. Check out local arenas that are long-lived and successful. What works for someone else in your area is likely to work for you. Even local arenas that have failed will give you a few tips. Information is power. Reputable local arena builders will be keen on getting your business and should be prepared to explain what materials they use and why. Is there geotextile fabric under that base? Not under the above arena’s base, no. We have terrible soft spots around the base of our arena which is a sand arena. The corners have been dug up on vrious occassions and refilled but the soft spots remain. This has caused the corners of the arena to become deep. Do you maybe have a suggestion to repair this problem once and for all. you are so right about location being the key. I have a property where the arena was built halfway across the property and also across the line of drainage/slope. The front half of the property is dry. The back half/downslope is wet due to the poor site selection. This also blocks your view of most of the property from the house causing a security issue with any horse turned out back there. cofibres are manufactured in Belgium by Cojarec. They are chopped poly-propylene fibre additive for stabilizing and enhancing new and existing sand based equestrian riding surfaces. The addition of Cofibres improves riding comfort by providing a stable base with a high energy return. If you are interested, please contact us. Many thanks. I am interested in finding out more about the cofibres product. Is is available in NZ? Thanks. Light and superstrong. 94% waterbuffering in one block. Blocks are made of basalt (Rockwool). I guess we were lucky when we built an arena in North Carolina. I say built, but really all we did was put a fence with a gate around a clear area. We had no problems with the surface because it was just natural N.C. red clay that had been packed down by hundreds of horses being ridden on it over the years. The one stupid thing we did….nailed the boards on the inside. This is great if you want to use it as a turn out pen so that the horses won’t push the boards off and escape. However, we had a bad accident because one of the boards had come loose and was sticking out just enough for the board to slip under the saddle flap as a horse went by close to the rail. Of course the horse was terrified and bolted, threw the rider, and tried to run away from the damn board which was still stuck under the saddle flap and so the horse thought it was being attacked. Finally the board fell off and the horse was o.k.,the rider was o.k. too, but it could have been much worse. I’m hoping to get advice on building arenas in lower areas. I list in coastal Virginia in Zone A that floods with a heavy rain. We have 5 acreas of beautiful flat land, but at a loss as to how to build an arena there. Any advice? Thank you in advance.